Background Drug-related problems (DRPs) interfere with patient’s health outcomes and have a negative impact on healthcare resources. Successful management of DRPs is an essential part of pharmaceutical care. Pharmacists should have adequate clinical knowledge in order to effectively implement pharmaceutical care and manage DRPs. 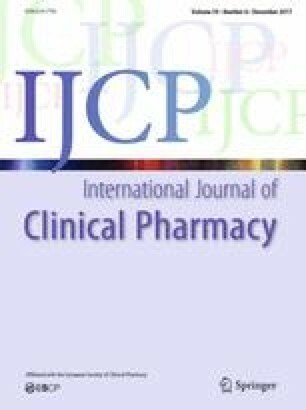 Objective To determine the clinical knowledge of community pharmacists in Croatia to detect and resolve DRPs. Method A sample of 302 community pharmacists have anonymously and voluntarily completed the validated survey-based clinical knowledge measurement tool. For each completed survey, all statements were scored individually, and a total score was calculated. The lowest possible total score was 0 and the highest was 80. Higher survey score indicates a higher level of clinical knowledge to detect and resolve a DRP. Results All community pharmacists had a mean score of 45.5 ± 8.6, while pharmacists from a pharmacy chain with mandatory education had a higher mean score of 50.2 ± 6.5. Multivariate linear regression revealed that only additional education (β = 0.272, p < 0.001) is associated with a higher mean score, while age and gender have no influence on the survey score. Conclusion Additional education of community pharmacists could increase their clinical knowledge to detect and resolve DRPs. The online version of this article (doi: 10.1007/s11096-017-0546-z) contains supplementary material, which is available to authorized users. The authors thank all participating community pharmacists and students for making this study possible, and Josipa Bukic, Doris Rusic and Dario Leskur for their support. van Mil JW, Horvat N, Westerlund T. The PCNE Classification V 8.0. Pharmaceutical Care Network Europe. 2017. http://www.pcne.org/upload/files/211_PCNE_classification_V8-0.pdf. Accessed 22 May 2017. Cousins D, Kijlstra N, Walser S. Pharmaceutical care—policies and practices for a safer, more responsible and cost-effective health system. European Directorate for the Quality of Medicines & HealthCare, EDQM, Council of Europe. 2012. https://www.edqm.eu/medias/fichiers/policies_and_practices_for_a_safer_more_responsibl.pdf. Accessed 22 May 2017.